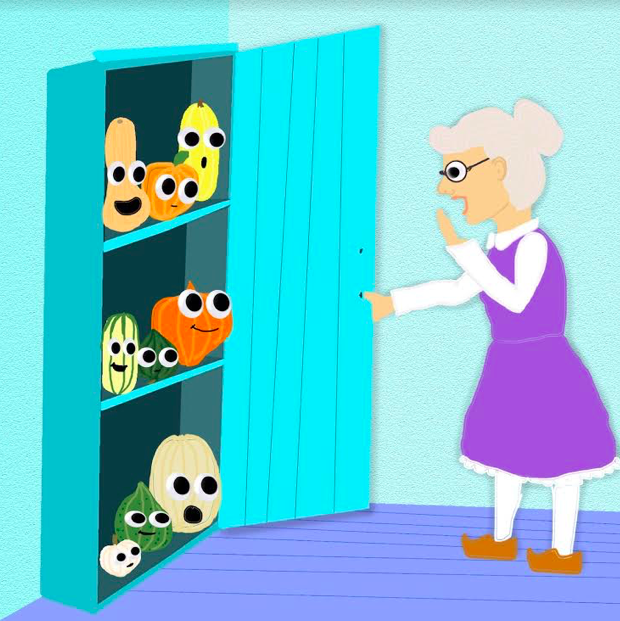 It was mid-autumn and Old Ma Hubbard went to her cupboard. Original artwork by Angela Ferrari. What she found was SQUASH! LOTS AND LOTS OF SQUASH! ready to make her brew. She called once again for her little squash friends. But they didn’t follow her cue! "Please do as I say without delay! Get into the pot don’t be tardy!" But tonight we are having a SQUASH PARTY!" I want to have a squash bake!" then danced with the sweet little Sugar-Pie. to the delight of the Delicata. Ol Ma Hubbard was feeling quite flubberd. "Get into this pot!" she roared. with the Acorn and the Gourd. Then a squash named Spaghetti threw some confetti. The Carnival Squash had a ball. the two of them started a brawl. "Hey, settle down," Ol Ma said with a frown, "I need to make some stew!" Baby Boo yelled, "Boo-hoo to YOU!!!" as it stamped on ma Hubbard's shoe. "Oh my gosh, what naughty squash! Just then came a sound from a gourd on the ground. "Hello, Ol Ma. Howdy do?" "I’m gonna put a stop to this Squashy Bee-Bop. You call me Ol Hubbard too." and all of these squashes I’ll tame!" Then the Hubbard squash put the kibosh on all of this squashing debauchery. "Let's stop this hogwash and show some panache. We need to behave properly! Ol Ma grew us from the ground from in a lovely dirt mound. Then watered us every day. She picked us when ripe without any gripe. Now it's our duty to repay. Let's make her a stew the best one we can do!" Then one by one they obeyed. The squash jumped into the pot without any fraught. Soon a stew was made. Old Ma invited the whole neighborhood to taste her delicious brew. They all took a bite then said with delight "Ol ma Hubbard we THANK YOU!!!" Angela Ferrari is a painter, children's book author/illustrator based in Portland, Maine. She is the creator and host of the Story Spectacular podcast.